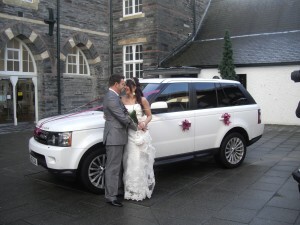 Cardigan Guildhall » Wedding celebrations and partnership ceremonies at the Guildhall, Cardigan. We like to take a flexible approach to wedding planning to ensure that you get what you want. Whether you would like us to manage your ceremony and full reception with all the trimmings or you would prefer a low-key, no-fuss ceremony with a few friends and family we will be happy to accommodate. We have three rooms to choose from and an enclosed courtyard for photographs and socialising. 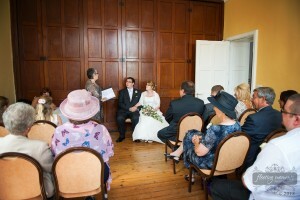 Our Great Hall will comfortably seat 30 to 120 for your ceremony and up to 80 at tables for the reception. The Chamber will accommodate up to 30 guests for the ceremony and can be used afterwards to serve a buffet or drinks. 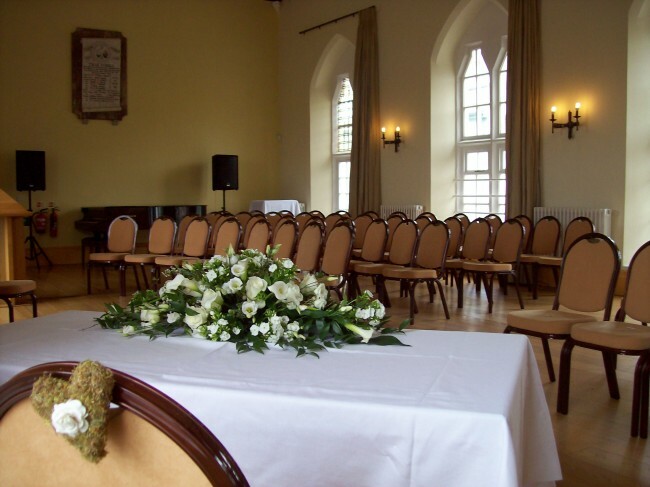 Our Radley Room will seat up to 50 for your ceremony and can hold 40 at tables. We are fully licensed for drinks and music and can provide a full bar service or we can arrange wines by the bottle for you to serve. You can bring in your own catering or drinks but we will make a small charge for handling. Our commercial-standard kitchen is equipped to provide full catering facilities – we always aim to offer a wide selection of local produce – or may be hired if you would like your own chef to prepare your meal for you. When one couple were married here the only guests were two witnesses and the dog. Chris and Ewa’s chef occupied the Guildhall kitchen for the whole of the previous day preparing the wedding breakfast. Once we were asked to freeze 9 bottles of vodka overnight for traditional Polish celebration at the reception. Ruth and Barry’s guests were entertained by a local harpist before they went to have their photographs taken at the seaside. Getaway vehicles have included a Beetle, a London bus and a tractor. For further information, please contact us here or you can find us on Facebook: Guildhall Cardigan and Cardigan Guildhall Weddings. Please note: for weddings the registrar must be booked separately. You can contact them by telephone: 01970 633580.